Image story telling in documentary wedding photography. My style of wedding photography is all about storytelling, I also tend to take photographs that will fit together as part of the story. Sometimes though it is possible to sum up the story in just one image as in the example here. This photograph does not require explanation or a caption as it tells the story of this part of the wedding day in one single frame. While some couples might prefer a bright and sunny portrait of themselves I like to think the sort of couples who get my style would frame this for the wall, it’s not my job to appeal to everyone so I actively seek out clients who appreciate the story telling documentary photography that I specialise in. This is a real moment from this couples wedding day, nothing is posed or set up. They’d just arrived from getting married in a nearby church when a thunderstorm rumbled over bringing a lot of rain. 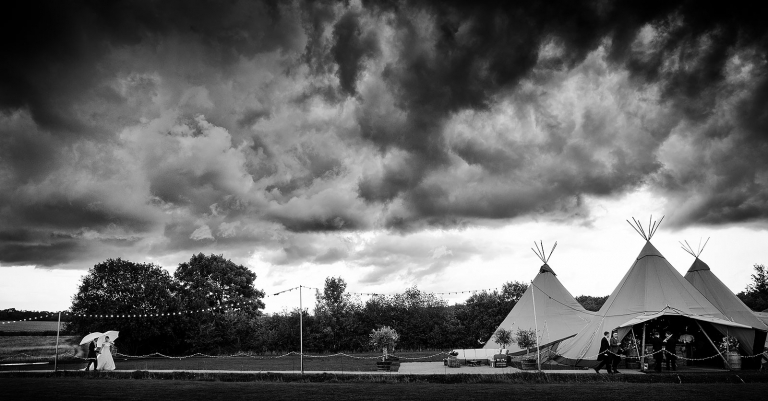 I’ve framed this a wide image in order to include elements important to the storytelling, the teepee, the couple with umbrellas and the dark and threatening sky.